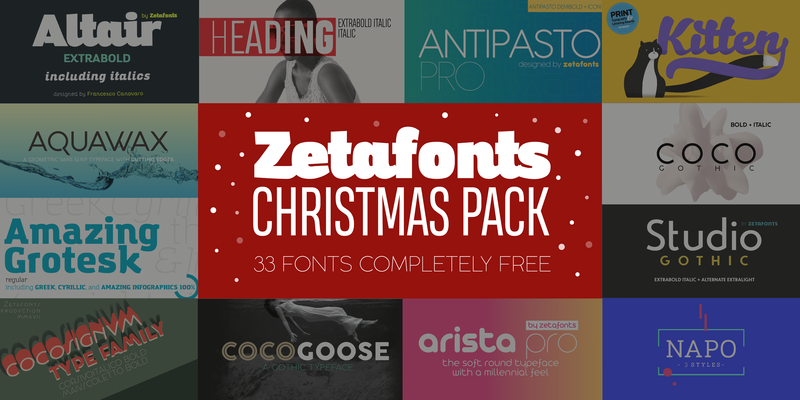 Celebrating Christmas with an amazing Font Pack: 33 completely free fonts from Zetafonts' best selling families. Features six stylish display typefaces, 5 icon sets, four serif and 15 sans serif typefaces and three crazy scripts that you can use in all your projects, commercial and non commercial. Featuring samples from bestselling and award winning zetafonts classics like Arista, Napo, Cocogoose and Kitten as well as free weights from our newest blockbusters Studio Gothic, Heading and Cinematografica, this pack allows you to enjoy the full range of Zetafonts typefaces in your design projects. Just click on the link to download the full versatile set, available until 7 January 2018.